Burns & McDonnell proposes to finance, design and build a new Kansas City International Airport, but some city council members are skeptical. 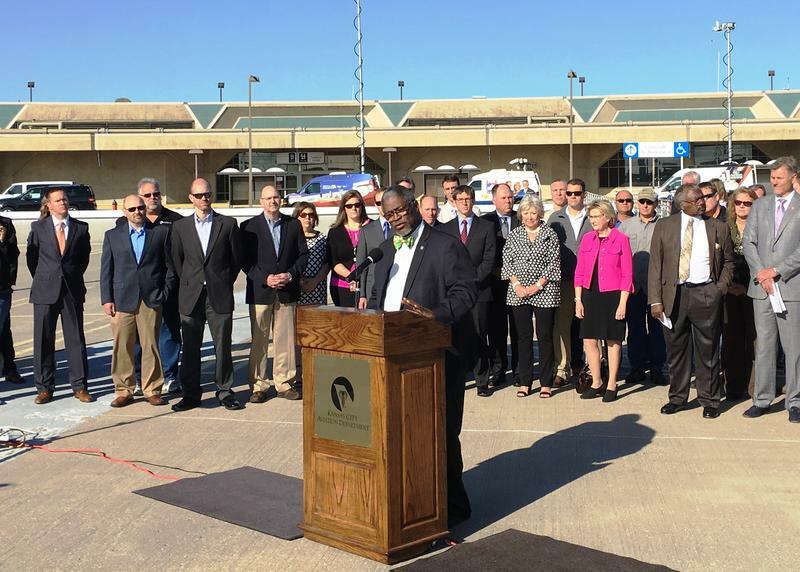 Kansas City Mayor Sly James last week unveiled a plan for a new terminal at Kansas City International Airport funded privately by engineering firm Burns & McDonnell. The firm proposes to foot the bill for the terminal in exchange for exclusive rights to design and construction. They’d be paid back over time with airport fees usually collected by the city. James and other city leaders hope to get the project approved by voters in November, and they're anxious to get moving. They want to sign a memorandum of understanding, or term-sheet, with Burns & McDonnell by June 15. That would give the firm exclusive rights to explore designs for the new terminal. But some city council members are skeptical of the plan. Teresa Loar represents the Northland and served on the airport committee. "I fully trust Burns & McDonnell to do the right thing. I mean, this is their home town, they're not going to screw it up. But, you know, they’re in a business to make a profit and I’m sure their partners are too, so that’s where we have to make sure that this deal is right for everyone,” Loar says. Loar, along with several other council members, wonders why other engineering firms aren't being allowed to compete for the project. “Constructing anything, particularly in the public sector, you bid on projects. Because that’s the fair way of doing business. And this would be a major, major shift in how the city does business,” Loar says. Mike Talboy, Burns & McDonnell’s government affairs director, says other firms had the chance to step up when Mayor Sly James asked the business community to come up with innovative solutions. Talboy, along with Loar and councilwoman Jolie Justus spoke with Steve Kraske on a recent episode of KCUR's Up To Date. He says they would have willingly competed for the bid before. Opening it up for competition now would slow down the process, and he thinks the current deal is actionable now. “We’re putting equity into the deal and we think this is a deal that would be something that can move forward," Talboy says. Justus, who chairs the airport committee, agrees, and she says the city is planning to hire independent counsel to examine the deal. Justus says the new plan solves taxpayers’ concerns. She says when a group of airlines last year recommended the city issue public debt to build the airport, voters strongly opposed the idea. So the city put the KCI conversation on hold. That's when Burns & McDonnell entered the equation. “They came forward and said that they would like to, rather than have us issue the public debt that we had talked about, they would like to do the private financing in exchange for the exclusive right to do the design- build of the project,” Justus says. Kansas City voters will have final say on the issue and Justus supports getting the project on the November ballot. But before that happens, Burns & McDonnell will have to assure the city they can get the airport designed and built for the nearly $1 billion price tag the city has established. To do that, they need to have an agreement in place as soon as possible so they can explore design options. The council will take up the issue during Thursday's business session. They're also planning several public hearings over the next month. Lisa Rodriguez is a reporter and newscaster for KCUR 89.3. Connect with her on Twitter @larodrig. There's a new proposal from architecture firm Burns & McDonnell that would use private money to fund construction of a new terminal to replace existing facilities at Kansas City International Airport.